This study has 7 sessions, incorporating an introductory session and 6 lessons. 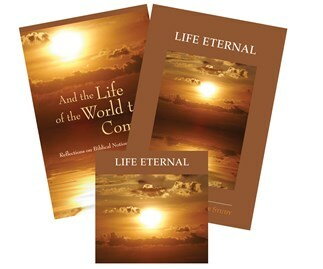 The study set includes the Study Guide by Clifford M. Yeary and a commentary, And the Life of the World to Come, by John F. Craghan (Liturgical Press). John F. Craghan is professor emeritus of religious studies at St. Norbert College in De Pere, Wisconsin. He is North American editor for Scripture in Church (Dominican Publications: Dublin, Ireland) and is the author of numerous books, including Psalms for All Seasons, which also serves as the commentary for Little Rock Scripture Study's Psalms I and Psalms II. His chief interest is to make the best of biblical scholarship accessible to a wider audience. The biblical promise of eternal life appears late in Scripture, but it blossoms into fullness with the resurrection of Christ. Explore the growing nature of the hope of those who have called upon the God of Abraham, Isaac and Jacob in the past, and the crystallization of our hope for eternal life in the victory of Christ over death. Those with some familiarity with Scripture will find it both inspiring and informative as the hope of eternal life develops and crystallizes through the sweep of salvation history.